We hope you noticed that Leesfield Scolaro, P.A. is now Leesfield Scolaro, P.A., recognizing Tom Scolaro’s 15-year career at our firm which began as a law clerk and research assistant. Tom has excelled in every way recognized by the trial bar and fully earned his placement as a named partner. During his career, Tom has tried numerous multi-million dollar verdicts, setting records throughout the state through his proactive and highly assertive litigation and trial skills. According to Founding Partner, Ira Leesfield, “Tom is a trial lawyer who consistently says ‘give me the ball.” He works tirelessly and never complains. His productivity demonstrates an understanding that the firm’s clients need to get their cases resolved: timely, but resolved fully. The announcement of Leesfield Scolaro has been well received with responses coming from Europe, Canada and throughout the United States, and, of course, from all points of Florida. Just this week, Leesfield Scolaro has undertaken a platinum sponsorship, by pledging $5,000 to Legal Services of Greater Miami to assist in the important and vital legal services they provide to the community. We will be an important part of the judicial leadership awards presented to Judge Bloom and Judge Gayles on May 13, 2015 at the Sixth Annual “The Art of Giving” Celebration and Judicial Reception. “This is particularly important to me,” says Founding Partner Ira Leesfield, “since I have known Judge Bloom and Judge Gayles from the inception of their legal and judicial careers.” Leesfield serves on the Federal Judicial Nominating Commission which recommended both of these judges to President Obama. 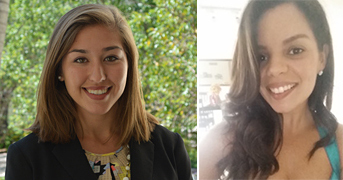 The firm’s community involvement continues with the Miami-Dade Chapter of the Florida Association of Women Lawyers (FAWL) awarding scholarships to Nejla Calvo (left), a third-year law student at the University of Miami School of Law, and Janelle Vega (right), a second-year law student at St. Thomas University School of Law at the Mandarin Hotel, in Miami, FL. Leesfield Scolaro was honored for their 18 years of scholarship participation, marking the longest commitment of any law firm to the FAWL Scholarship program. Last year, FAWL recognized Ira Leesfield as “Philanthropist of the Year,” and the Leesfield Family Foundation, Judge Ellen Leesfield and Leesfield Scolaro continued to show their commitment to FAWL and its significant work in the legal community. In the meantime, the firm showed its appreciation to New York lawyers with the mailing of “Apples & Oranges”, highlighting the close ties between Leesfield Scolaro and New York lawyers. Both Tom and Ira were born and raised in New York. Tom attended college there and Ira has been an active member of the New York State Trial Lawyers Association since 2003. The firm’s diversity continues with significant recoveries in maritime and passenger cruise cases, wrongful death and personal injury cases throughout the State of Florida, and medical negligence and products liability successes throughout the year. The Orlando office, joining Bounds Law Group, has made a significant impact in Central Florida in the I-4 corridor. Cases are now pending in every Central Florida county, the southwest coast of Florida, the I-4 corridor and most recently, several matters were resolved in the Florida Panhandle, as well as Jacksonville. Leesfield Scolaro’s growth this year, includes the addition of Daniel Diaz-Balart, who left a stellar career at the Miami-Dade County State Attorney’s office after four years. “Danny hit the ground running,” says colleague, Justin Shapiro, who had a number of significant and noteworthy successes during the year, including a record-setting result in Monroe County/Plantation Key. Carol Finklehoffe continues her presence as Chair of the Maritime Law Association Cruise Line Passenger Ship Committee, and recently completed a number of cases with clients from California and Virginia. 2014 was a rewarding year for the firm because it was a successful year for our clients. A number of new challenging and important cases are ready to be filed in 2015. We are always here to help and appreciate all of your support. At the Clinton Foundation celebration of the 10-year anniversary of the Clinton Presidential Library in Little Rock, Arkansas, Senior Partner Ira Leesfield was appointed by President Bill Clinton to the Clinton Foundation Haitian Initiative to assist in providing vital services to the people of Haiti. Leesfield continues his involvement in the Clinton Foundation, Clinton Global Initiative and the Presidential Library.